Rory McIlroy and Tiger Woods kept up their BMW Championship challenge to sit one shot behind leader Vijay Singh at halfway in Indiana. 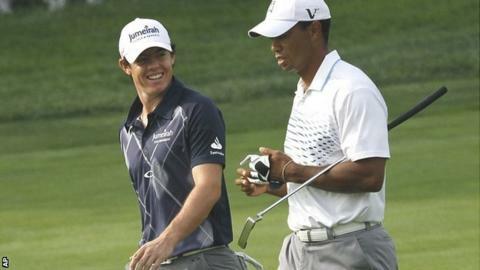 McIlroy, who has won two of the past three PGA Tour events, added a 68 to his opening 64, while Woods shot 67. Fiji's Singh leads the way at 13 under after a 66 as Lee Westwood climbed into a share of third at 11 under with a 65. American Ryan Moore was also 12 under, while Graeme McDowell carded 67 for nine under at Crooked Stick. The 49-year-old Singh, a three-time major champion and former world number one, won the last of his 34 PGA Tour titles in 2008. "I've got to keep it going," he said. "I've been playing well for two days for a while now, but I need four days of good playing. "Sooner or later I think four days is going to happen, and hopefully it starts this week." World number one McIlroy, the joint overnight leader with Bo van Pelt and Graham DeLaet, fired an eagle and six birdies but also leaked four bogeys as he dropped level with Woods, who carded a bogey-free 67. McIlroy won the FedEx Cup's Deutsche Bank Championship on Monday, just three weeks after claiming his second major with an eight-shot victory in the US PGA Championship. "It wasn't as good a day as yesterday," said McIlroy. "I didn't hit the ball quite as well, but scored well and did enough to go out there and shoot another good number and set myself up in a good position going into the weekend." Despite his five-under round, Woods said he was "fighting hard" to make a score. "I was just slapping it everywhere and somehow just had to grind away and find a way to shoot something where I was in double digits [under par] by the end of the day," he said. There is no cut at Crooked Stick and the top 30 will progress to the Tour Championship in Atlanta, the fourth and final FedEx Cup play-off event at the end of the PGA Tour's regular season, where the overall points winner pockets a $10m (£6.3m) bonus.